Regular recreational football practice: might it be the fountain of youth? The stimulus for this post was the recent paper by Trappe et al. (2013) published in the Journal of Applied Physiology. Two research groups –one from the Ball State University, USA and the other one from the Karolinska Institute, Sweden- collaborated for this study with the aim to measure the aerobic power and myocellular markers of oxidative metabolism in lifelong endurance athletes and age-matched, healthy untrained men aged above 80 years. The endurance athletes had been engaged in vigorous aerobic exercise their entire life and were still active participating in sports 4-6 times per week. The analysis showed a remarkably high aerobic power for lifelong exercisers (maximal oxygen uptake ranging between 34 and 42 ml/kg/min). This high aerobic power was accompanied by a greater muscle oxidative capacity of the lifelong exercisers compared with the control group men. What is the effect of high aerobic power on health? Several studies have shown that a high aerobic power is associated with lower mortality rate. Indeed, for every 1 MET increase in aerobic power above 5 METs the mortality risk may be lowered by 12%.Thus, a high aerobic power is a key component of all programs targeting health improvement. How is this study linked to football? Besides the biological effects, it seems that regular football practice has considerable positive effects on psychological status too (Krustrup et al., 2010a & b). Given this evidence it seems logical to suggest that regular football practice at somehow high intensity may improve health and lower mortality rate. Krustrup et al. Executive summary: The health and fitness benefits of regular participation in small-sided football games. Scan J Med Sci Sports 20 (Suppl 1): 132-135, 2010a. Krustrup et al. 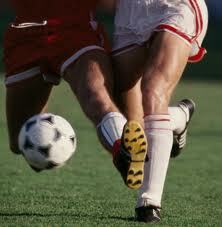 Recreational football as a health promoting activity: a topical review. Scan J Med Sci Sports 20 (Suppl 1): 1-13, 2010a. Trappe et al. New records in aerobic power among octogenarian lifelong endurance athletes. J Appl Physiol 114: 3-10, 2013. Tommy Lundberg and colleagues from Mid Sweden University published a nice study in the first issue of the Journal of Applied Physiology for 2013. Their hypothesis was that aerobic exercise training (AT) will act synergistically with resistance training (RT) to promote muscle hypertrophy. Although contradictory to the general view, this hypothesis was based on recently published data by the same group showing an enhanced protein synthesis in response to knee extensors RT performed 6 hours after AT on the cycle ergometer compared with RE only (Lundberg et al., 2012). What they did in the 2013 study? · 10 moderately trained men with modest experience to weight training who had performed no regular RT before volunteered for this study. · Individuals performed 5 week unilateral knee extension aerobic and resistance training (AT+RT) while the contralateral leg performed RT only. · RT was performed 6hr after AT. · Individuals performed 15 AT and 12 RT sessions and showed 100% compliance to the program. · Quadricep femoris volume and cross sectional area, isokinetic strength and power and endurance were evaluated before and after training. · A greater increase in quadriceps muscle volume after RT+AT compared with RT (13.6% vs 7.8%, respectively). All individuals presented greater increases in muscle volume with RT+AT. · Normalized torque (Nm/cm2) increased less –though not significantly- after RT+AT (12%) compared with RE (19%). · Increases in isokinetic peak torque were also similar across velocities for both RT+AT and RT. · These findings suggest that muscle hypertrophy observed after AT+RT dissociated from the gains in muscle strength and power. In fact, the gain in muscle strength and power tended to be greater with RT. It seems that concurrent aerobic and resistance training might promote hypertrophy at least in moderately trained individuals. We don’t know if this holds true for well-trained football players or individuals. However, this hypertrophy might not be translated into greater gains in strength & power. Individuals might benefit from concurrent aerobic and resistance training since they might gain more muscle mass compared to resistance training only. Fat mass increment is important to combat excess body weight and fat by promoting a greater metabolic rate and to improve glucose metabolism. Aerobic training was contacted for a single “isolated” muscle group using a very well controlled experimental set-up (one-legged cycle exercise). Moderately trained individuals took part in the study and this might affect generalization of these findings to other populations and sports. Lundberg et al. Aerobic exercise alters skeletal muscle molecular responses to resistance exercise. Med Sci Sports Exerc 44: 1680-1688, 2012. Lundberg et al. Aerobic exercise does not compromise muscle hypertrophy response to short-term training. J Appl Physiol 114: 81-89, 2013.